For our Thanksgiving hike, we decided to knock off another section of the Appalachian Trail through Shenandoah National Park. This six mile hike includes a visit to the boulder summit of Blackrock mountain and a side trip to a PATC hut. The view from Blackrock is beautiful! 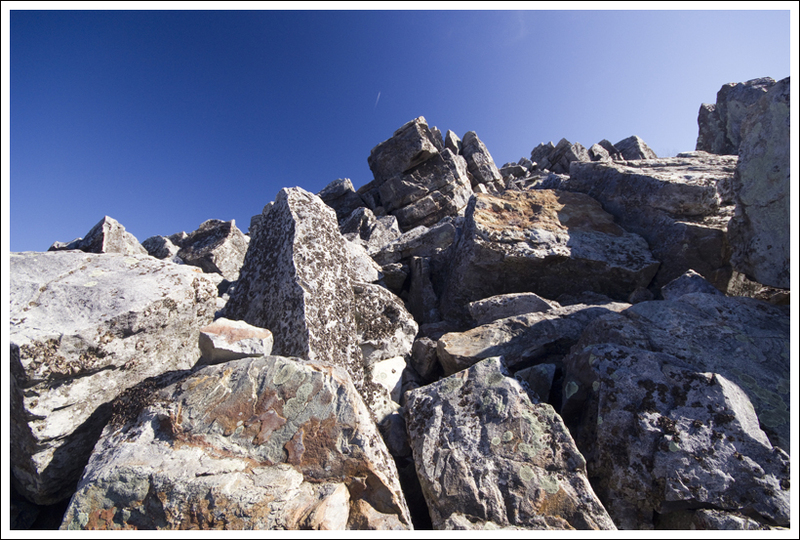 Below: The summit of Blackrock is a massive jumble of boulders left behind by an ancient collapsed cliff; Adam looks at the different hiking options around Blackrock. This area is popular with families and day-hikers due to its short length, With all the leaves down, Skyline Drive was visible many places along the trail. For the last several years, we’ve had our own non-traditional Thanksgiving Day celebration We start off with a morning hike, and for dinner we have homemade pizza. Since it is typically just the two of us, we haven’t felt the need to make a big turkey with all the trimmings. Christine isn’t a big fan of turkey, so we decided to have something for dinner that we both enjoy even more. But to keep with a little tradition, we take a piece of pepperoni, make a wish, and tug on both ends. Whoever gets the majority of the pepperoni, gets their wish. And there is also usually football on the TV. 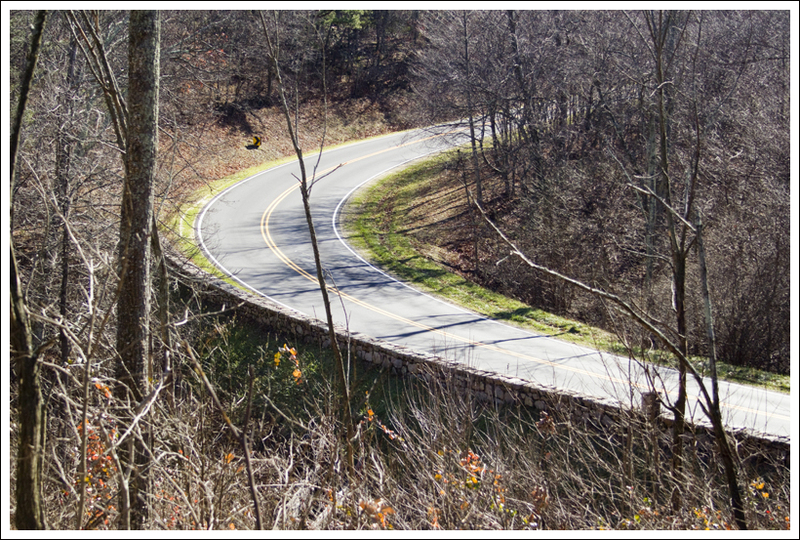 We started off our 2011 Thanksgiving hike by parking one car on the side of the road at mile marker 89 (after the Horsehead Mountain overlook) where the Appalachian Trail crosses Skyline Drive. We then drove back to the Brown Gap parking lot (near mile marker 83). 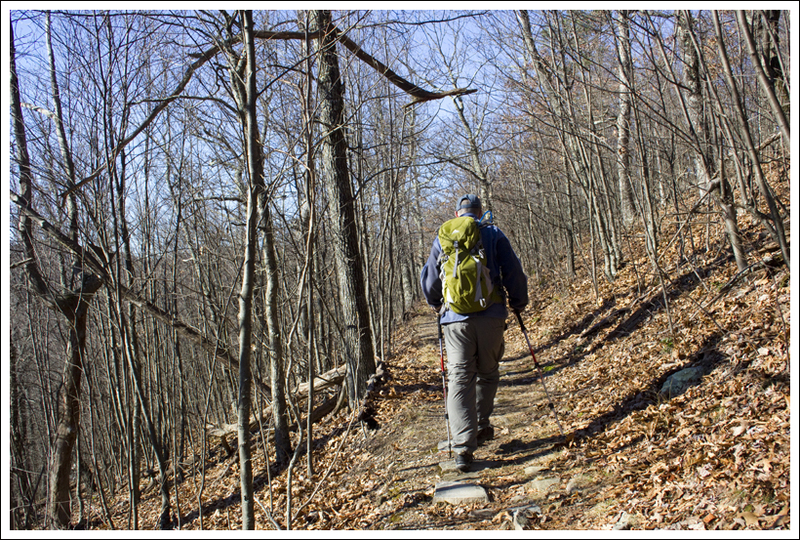 The white-blazed Appalachian Trail begins across Skyline Drive. The trail starts off with a gradual uphill. At .8 miles, you may begin to smell campfires or see a few people since it goes right behind the Dundo Picnic Area. At 1.3 miles, the trail intersects with the Jones Run Trail and then at 1.5 miles, the trail crosses Skyline Drive again. The trail continues uphill to make your way up to the summit of Blackrock mountain. The rock jumble on Blackrock is impressive. Below: Adam hikes around the summit; Adam hikes along the AT under bare trees. At mile 2.0, the trail skirts a Blackrock parking lot. 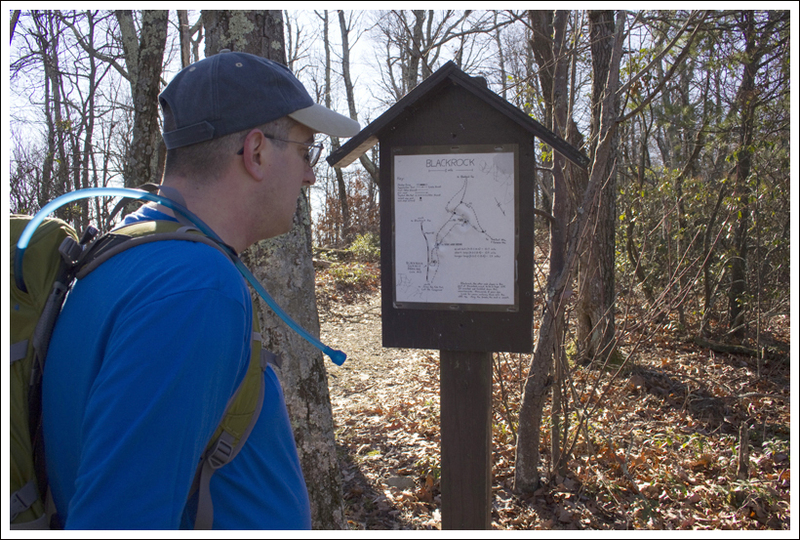 A sign shows some alternate ways up Blackrock mountain, but just stay on the Appalachian Trail. 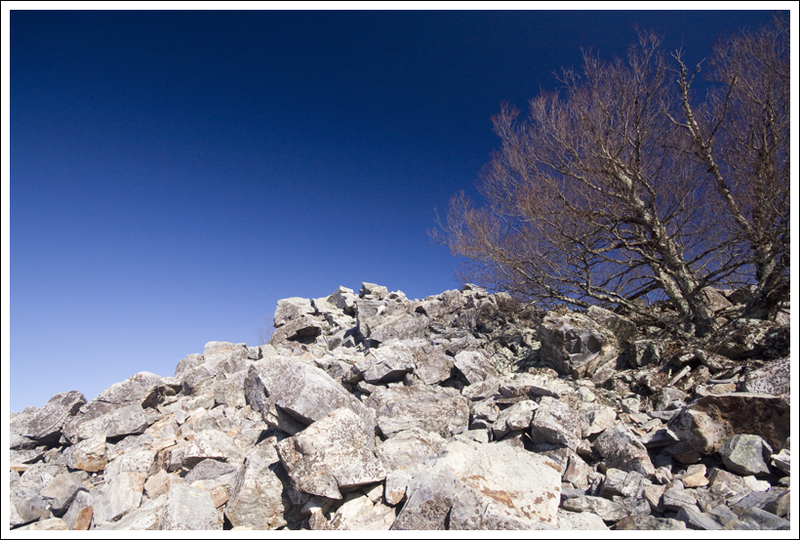 At 2.5 miles, you should reach the boulder pile for the summit of Blackrock. You will see some nice views from this point and from a nearby overlook as the trail winds around the summit. The trail then starts descending rather steeply down the other side. At mile 3, we took the spur trail that leads to Blackrock hut. The hut is about .2 miles away down a steep out-and-back trail. 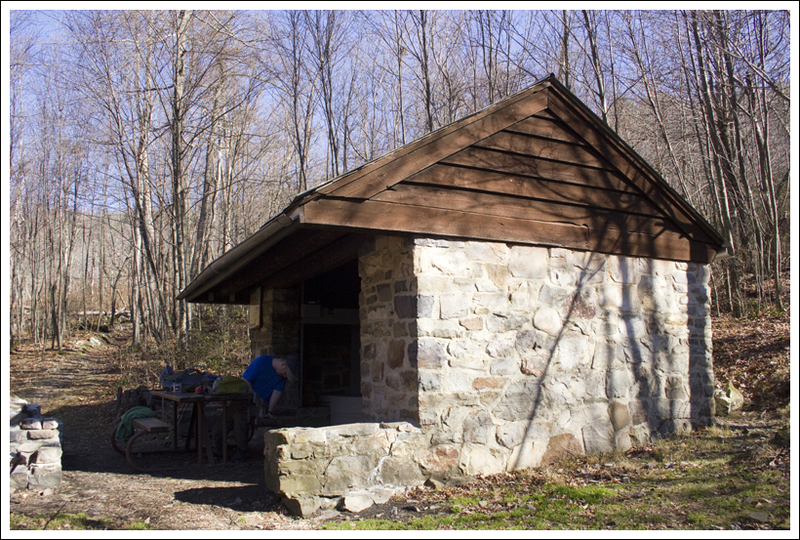 We visited the hut and returned to the Appalachian Trail at mile 3.4. At mile 3.9, the trail crosses Skyline Drive. At this point, the trail begins to go back uphill and goes up and down two small hills until you reach your car at mile 6.0. The best part of this hike is clearly the Blackrock summit. 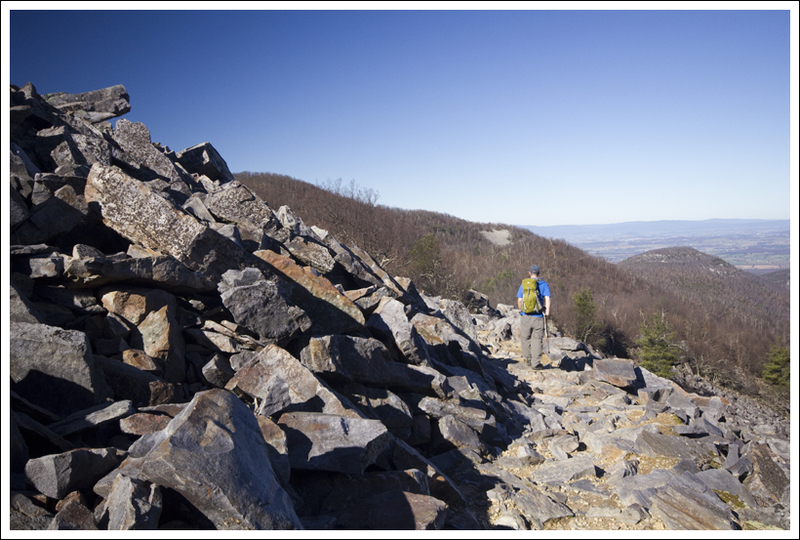 It is fun to climb around on the boulders and the views from this area and the nearby overlook are great. Many people hike this summit from the Blackrock parking lot. For a one-mile hike from the parking lot, this does give you a good payoff for little effort. Since it is a short hike, you should expect to see other people on this hike during most nice days. Since it was Thanksgiving, Christine and I talked to each other about what we were thankful for. I am very thankful to have an amazing wife, three dogs that are a great part of our family, a job that enables me to enjoy the rest of my life, and the ability to be able to hike with Christine through some gorgeous areas of Virginia. I’m very thankful to have the life that I have. We only have about 12 more miles to finish the southern section of Shenandoah National Park. It is always amazing to us when we are driving to cover our next section that we have been able to cover all this distance on foot. Well… this post has been a long time coming! I can’t believe it’s taken us nearly a month to get details about our Thankgiving hike onto the blog. The holiday season is always so busy and chaotic! As far as hikes go, this one was pretty low-key. There was one great view from Blackrock, but it was mostly walking through the woods. The terrain was really easy and the weather was really warm for late November. We only saw one other group of people the entire day – a family hiking up to Blackrock. I really enjoyed the walk down to visit Blackrock Hut. 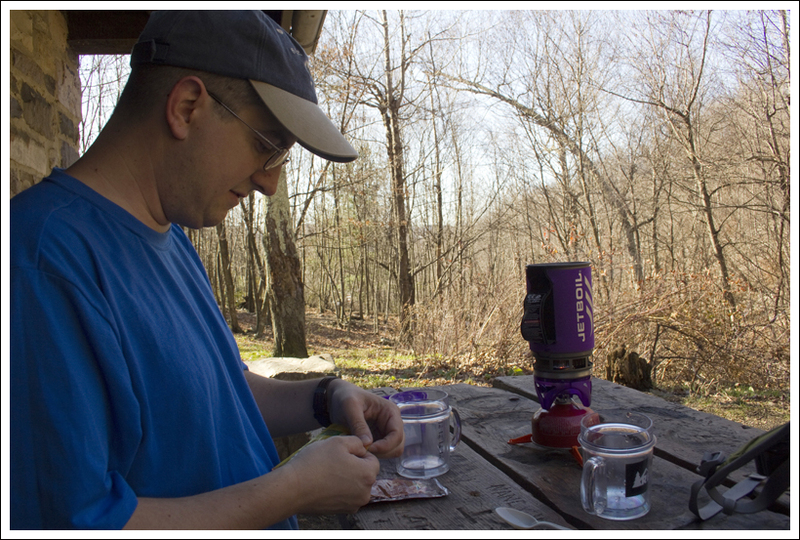 Adam surprised me by bringing our JetBoil along. 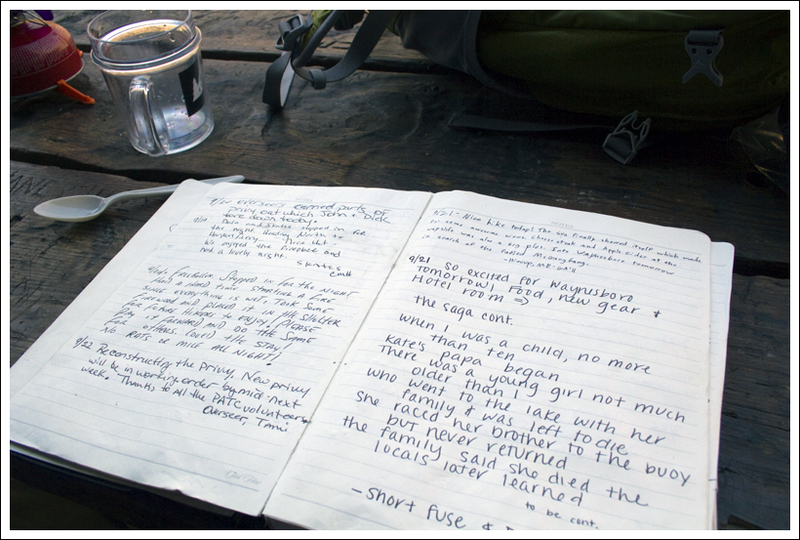 We got to enjoy drinking hot beverages while perusing the shelter log. He had cocoa and I had hot cider. The hike was such a fun and relaxing way to spend the holiday morning. We made a stop at Blackrock Hut. Below: The shelter journal; Adam makes cider and hot cocoa, Our non-traditional Thanksgiving dinner. I can’t even begin to describe how much I love our Thanksgiving tradition! I used to spend the entire day in the kitchen – basting the turkey, preparing a zillion different side dishes and setting the table. I would stress over getting everything onto the table at the same time. And worst of all… by the time the meal was ready, I really didn’t even want to eat it. And then there was the sink full of dishes, weeks worth of leftovers and the dreaded turkey carcass to contend with. Now I get to go for a hike and spend the majority of the day outdoors. 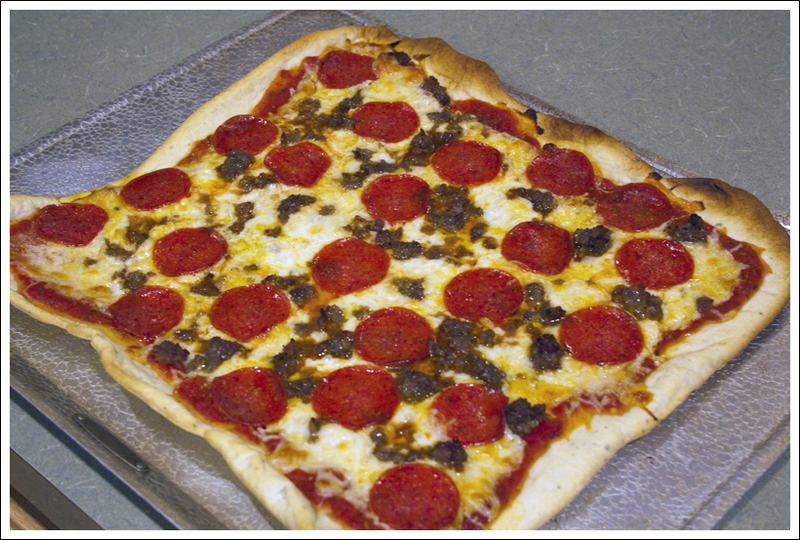 Plus, homemade pizza is easy, no-fuss and delicious after a hike. Difficulty – 2. There is some uphill at the end of the hike, but most of the hike is flat or downhill. Trail Conditions – 3.5. Overall was pretty well-maintained, but there were a few trees across the trail to navigate coming down from Blackrock summit. Streams/Waterfalls – 1. A small, mostly-dry stream was near the Blackrock hut. Wildlife – 1. We didn’t see anything beyond birds and squirrels. Ease to Navigate – 4.5. Just stay on the Appalachian Trail. Solitude – 3.5. Expect to see people around Blackrock mountain, but otherwise, not a lot of traffic on this hike. Directions to trailhead: Leave one car on the side of the road at mile marker 89 (after the Horsehead Mountain overlook) where the Appalachian Trail crosses Skyline Drive. Drive back to the Brown Gap parking lot (near mile marker 83). 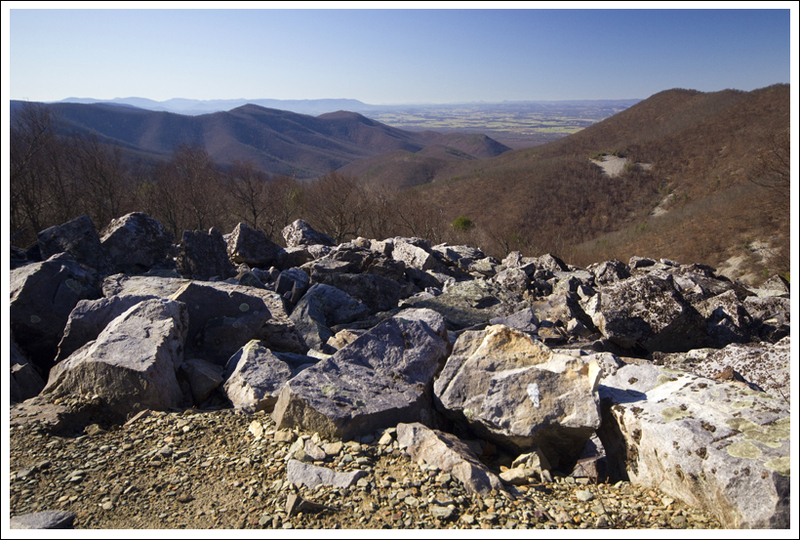 The white-blazed Appalachian Trail begins across Skyline Drive. My husband and I stay at the hut quite often. We actually maintain part of the AT right there. Great write up!